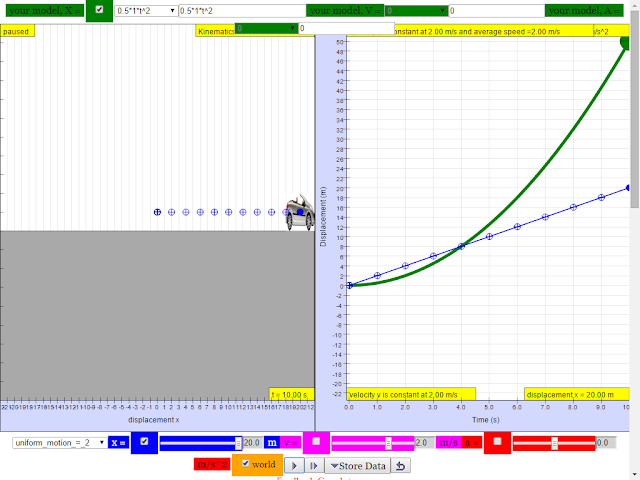 Drag the blue dots in the V-t diagram to set up how the velocity changes as a function of time. Press play to watch how the x-t and a-t diagrams changed with the setting. i am trying to make the text to appear which i have not problem with now..
// is it like this? else if ( a > 0 && vti > vt ) // how to make java statement to check acceleration is the same as t change? assign speedi = speed inside the loop // forcing speedi = 10 let say. 2. how to make java statement to check acceleration is the same as t change? if the acceleration is a, define a new variable a2=a. any idea how to fix this error message ? You need to fix the above logical error (run time error). this is work in progress i have made some customized teaching n learning words. Seems to help solve it thanks! by providing else if id>n to allow a way to return a value. YA! No! It is not correct. Run time error will occurs when id equal n-1. It is even worse if you changed it to id<=n , because error will occur when id equal n-1 or n.
You do not need to add else if(id>=n) , because it will always be satisfied (if it did not satisfied previous if condition). P.S. I did not check the formula, I only check for logical statement. it definitely works now, thanks for the useful codes to copy and paste. as the user move the green dots T[j], yv[j], how to make they green dots snap to integer values ? currently the green dots can be any double value which is difficult to use especially if want to explore simple numbers. i tried change the type to integer but it did not work out. Define a variable e.g. id and set property "element" for particleSet to id. When user drag one of the particle, the id will contain the index for the particle. id will be -1 if none of them were dragged. if the position of y is yv (which is an array). You can add similar code to others. (int)yv[id] will change the type to integer , so the value will be truncated. But yv[id] is a double so we need to change the type back to double. working on 2 files now. i like the interface of weexvrelation06.xml, but i thought got bug so i moved to weexvav10.xml. i like the programming of weexvav10.xml as i have recently spent my time here. i followed the "set property "element" for particleSet to id." but i monitor the value of id, it is always zero. the rest of the code works! but because the "set property "element" for particleSet to id." didn't work, only the yv works now. Add a new field, variable j format "j = 0.0"
in the drag action field. Please add id>-1 , because id equal to -1 when none of the element was selected.